Filmmaker David Lynch is weird. But you already knew that. It is what makes him a great filmmaker. I’ve always been a big fan. 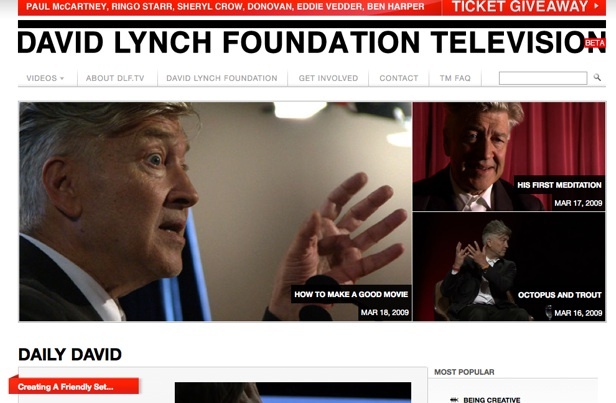 But I’m not so sure about his new Website, David Lynch Foundation TV. The foundation is “dedicated to providing students with the opportunity to learn how to meditate.” Apparently, Lynch is really into transcendental meditation. The new video site shows Lynch talking about the benefits of transcendental meditation and what it is. It will also showcase documentary footage from Foundation events and benefit concerts. Paul McCartney, Ringo Starr, Sheryl Crow, and Eddie Vedder are giving one at Radio City Music Hall on April 4. The site promises to deliver a daily dose of David Lynch (he talks about movies as well a meditation) and free concert footage. I would share a video here, but they are not embeddable (actually they are, see below). I told you he was weird. The DLTV site doesn’t publicly launch for another six days, but if you are into David Lynch or meditation, you can get beta access by registering here with the code twinpeaks. We have 500 invites for TechCrunch readers. You guys need to learn how to relax.